The page is used to index a number of rides that CTC members have enjoyed. 1 South west maintain a map of off-road routes in the South West. The site conatins maps, photos and videos of selected routes which are graded according to skill level. A Chevron ride is a route which incorporates 50 arrows on the OS 1:50,000 maps. On a normal map a single arrow denotes a climb of around 1:7, and for climbs in excess of 1:5 gradient there are usually two black arrows, so to get fifty you need a pretty hilly ride. We are in the process of designing several routes which you can ride to get your Chevron badge. The newest one is the Haldon Loop. You can ride on your own, in a group, or as part of the clubrun. The time limit to complete a Chevron ride is 12 hours. The Haldon Loop - 108 km, 2,000 metres of climbing. Kevin Presland, the President of CTC Devon, has published a guide book On Your Bike in Devon which documents a series of routes which showcase some of the best cycling in Devon. 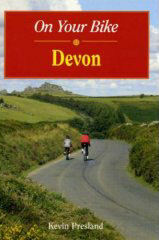 On Your Bike in Devon, Kevin Presland, Countryside Books, 2004, ISBN 1-85306-847-0. This page was last edited on 1 October 2015, at 13:18.